In 2016 Il Ngwesi was 20 years old. Supporting both communities and wildlife, it remains the only upmarket lodge that is both owned and run by the community. Its significance cannot be overstated. Neighboring Lewa, Borana and Lekurruki, Il Ngwesi covers 16,500 hectares and is home to the Il Lakipiak Maasai – ‘people of wildlife’. Truly special, this award winning enterprise combines eco-tourism with sustainable environmental management and community development. 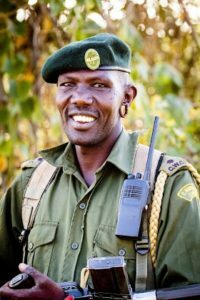 Early Days: Following an approach by Ian Craig from neighbouring Lewa Wildlife Conservancy in the mid 1990s, Il Ngwesi became the first Maasai Group Ranch in Laikipia to join Lewa on a conservation and community development journey with a vision far beyond its borders. Community elders agreed to set aside 8,675 ha of their grazing land for conservation, and in 1996 with funding from USAID through the Kenya Wildlife Service, the superb Il Ngwesi Eco-Lodge was built. 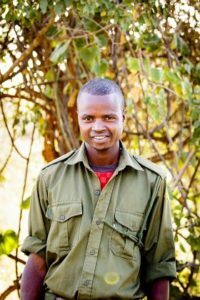 From the 80 men that worked for 10 months to build the lodge, 10 were selected to be trained to run the lodge and host tourists. 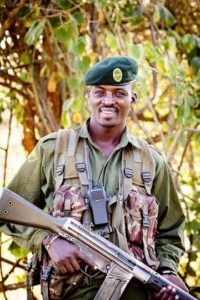 A team of rangers (now totalling 16) was also trained at Lewa to oversee security, and monitor and protect people and wildlife. Wildlife Returns: Wildlife numbers steadily increased. 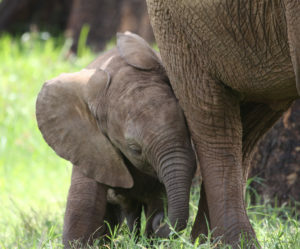 More elephants were evident almost immediately, and within five years numbers had grown significantly, having found a safe place to rest and feed. With the exception of Water Buck that were translocated, all other species native to the area recovered naturally, including the endangered Grevy Zebra, Reticulated Giraffe and Gerenuk (three of the ‘Northern Five’). 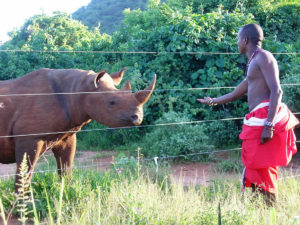 In 2002, a rare Black Rhino male known as Omni, hand reared on Lewa after being born to a blind female, was translocated to a protected and fenced sanctuary close to the lodge. It was joined in 2006 by two White Rhino, also from Lewa. 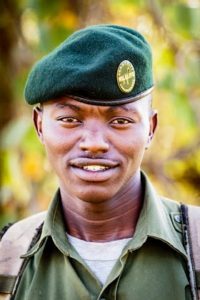 Tragically in 2013, Omni became a victim of rhino poaching, but the two white rhino remain and the rangers watch over them night and day. All of the main predators including Lion, Leopard, Cheetah, Hyena and Jackals are now present in the Group Ranch. The model: Profits from the lodge, donations from well-wishers and partnerships with local and international NGOs all support a range of community projects while at the same time ensure that the environment is managed sustainably. The model helps to foster communities that value wildlife and see purpose in acting as custodians of the land. Crucially, Il Ngwesi is one of 33 conservancies that are supported by the Northern Rangelands Trust (NRT) and that collectively cover 440,000 square kilometers. As well as providing a large and secure environment for wildlife populations to live and migrate to and from, the NRT supports communities to develop and benefit from tourism. This managed land mass is particularly important for the conservation of endangered species including the African Lion, African Wild Dog, and African Elephant as well as some species found only in northern Kenya such as the Grevy Zebra.